Moisés G. Contreras is a Junior at the University of Illinois majoring in Psychology and Italian, with a minor in Latina/Latino Studies. After completion of his degrees, he hopes to spend a year teaching English abroad. Naples is one of his favorite Italian cities, and very probably the site of his studying and teaching abroad plans. The relationship between the majority and the minority can be detrimental, especially when it is overlooked and equity is not at the forefront. It is then interesting to apply this idea in a linguistic realm, where minority languages are mainly esteemed poorly and as not worthy of acknowledgement. In the situation of Italy and the question of regional and minority languages, the main issue is the vigorous and inconsiderate spread of Standard Italian across the state. There is legislation in Italy to protect certain minority languages, (Law 482/1999), but this law is not enough for the protection and cultivation of Italy’s regional languages. What is the particular reason that Neapolitan, for example, is not protected by a similar legislation, or even recognized in general for that matter? The Neapolitan language is spoken in the southern part of Italy in regions like Abruzzo, Calabria, Campania, Lazio, and others nearby. This is roughly the area once covered by the Kingdom of Naples, after which the language was named. With the conception of the Kingdom and the language begins the vast and rich history of Neapolitan culture in literature, music, theater, and more. 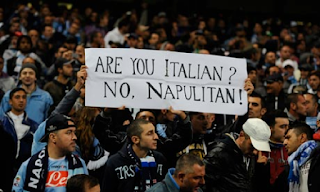 In regards to the Neapolitan musical history, la canzone napoletana, or “Neapolitan song”—which refers to the music sung in the Neapolitan language— is considered lightly prominent globally. For this reason, many say that the Neapolitan language is therefore the most known and exported worldwide amongst the Italic languages. And while it is a great tool to disseminate the Neapolitan language, this does not necessarily mean it is a tool being used to instruct the language or ensure its vitality by any means. Unfortunately, this prominence is satisfactory for many political actors, since “the languages that show a higher degree of vitality tend to be less promoted, in the sense that fewer associations and organizations exist to protect them and their presence is more limited in education (including adult education)” (Coluzzi, 2008, p. 223). This mindset is extremely harmful to any regional language and it highlights the neglect many of these languages receive. With the propagation of Standard Italian thanks to, (or perhaps blamed to), mass media, institutional instruction, and other methods, this “ongoing process of Italianization… is slowly eroding these [regional and minority] languages from the inside” (Coluzzi, 2008, p. 219). For now, though, Standard Italian and Neapolitan are barely mutually intelligible, considering their distinct grammatical differences in lexicon and structure. Despite the steady decline in use of regional languages, made clear by ISTAT survey responses, there still is only a meager amount of laws and policies that make any type of effort to protect them. Sure, there is Law 482/1999, but it only offers protection to twelve minority languages in Italy. Even without much knowledge of this law, the map provided offers an idea of exactly which languages are protected, (mostly the languages of the minority communities in the nation). Although even with this protection, Friulian and Sardinian, sometimes regarded as varieties of Italian, “are usually considered to be a ‘poor’ or ‘impure’ image of the idealized language” (Iannàccaro & Dell’aquila, 2011. p. 38). The negative image that Italian ‘dialects’ are given alludes to the problem at hand: there is a severe lack of importance placed on protecting the languages of the many different cultures in Italy. This “deliberate socio-political behavior” (Iannàccaro & Dell’aquila, 2011, p. 37) against the proper protection and preservation of these languages cannot be tolerated. It is as if political officials are willingly oblivious to the fact that, again referring to Neapolitan, there are many signals as to the decline of the language and its current eventual death. With UNESCO’s 9 factors, we can pinpoint a couple of these indicators in the Neapolitan language. In terms of intergenerational language transmission, probably the most important factor in ensuring a language’s vitality, Neapolitan has been graded as unsafe. This finding, coupled with the lack of Neapolitan instruction in educational institutions, paints a dreary picture for the future of the language as well. And mass media might as well be an accomplice to this attempted language murder, since it has very minimal response to new domains and media. It comes to no surprise to know that Neapolitan has no official status in any Italian region, despite its prominence. Neapolitan was merely the language in question in this post; however, it can be used as a representative of Italy’s regional languages and the injustice they are served. While the standardization of the Italian language is an exemplary method to unify the nation and build an identity that was missing up to recent times, it is disheartening to see what is consequently being neglected. Italy is a mosaic formed by the different cultures found within the regions in the peninsula. To be unbothered by the eventual loss of these regional languages would be ironic and counterproductive to cultivating and fundamentally understanding the true Italian culture and identity. May Italy and more importantly the Neapolitan people never forget, in the lyrics of a Neapolitan song, “comme si' bello, oje core napulitano”, (how beautiful you are, oh Neapolitan heart). Coluzzi, P. (2008). 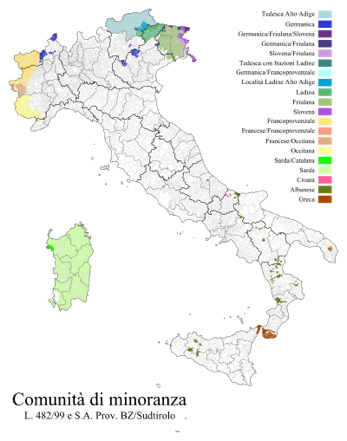 Language planning for Italian regional languages (“dialects”). Language Problems & Language Planning. 215-236. Iannàccaro, G., Dell’aquila, V. (2011). Historical linguistic minorities: suggestions for classification and typology. Int’l. J. Soc. Lang. 29-45.